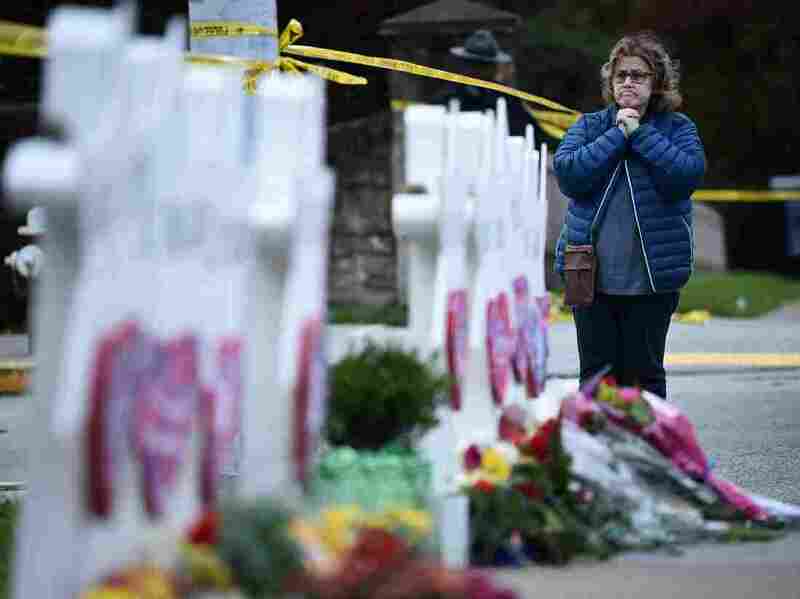 Synagogue Shooting Follows Historic Rise In Anti-Semitic Incidents And Online Attacks A rise in anti-Semitic rhetoric has become normalized in this country and, unless it is condemned, it gives the green light to extremists, warns the Anti-Defamation League. A woman prays before a memorial outside the Tree of Life synagogue after a shooting there left 11 people dead in Pittsburgh on Saturday. In the wake of Saturday's murder of 11 Jewish worshipers at the Tree of Life synagogue in Pittsburgh, and after the recent wave of explosive devices sent to prominent Democrats, groups that promote tolerance are calling on politicians to tone down hyper-partisan rhetoric and ad hominem attacks they say are contributing to a national atmosphere of division, fear and even hatred. "The reality is words have consequences," says George Selim, the Anti-Defamation League's senior vice president of programs. The ADL calls the killings at Tree of Life synagogue the single deadliest attack on American Jewry. The group has been sounding the alarm for months on what it says is a historic 60 percent rise in anti-Semitic incidents from 2016 to 2017, the biggest single-year increase in reported anti-Jewish hate since they started tracking such data almost 40 years ago. The reality is words have consequences. "When anti-Semitic rhetoric or dog whistling or rhetoric that's of an extreme nature is really allowed in our public square without condemnation — especially from the highest leaders who are public officials — it really gives the green light to anti-Semites, bigots, xenophobes and Islamophobes to keep spouting it and acting on it," Selim says. "And that's what we saw at two different occasions in this past last week both in Pittsburgh and with the pipe bombings in New York and elsewhere." Another recent ADL report shows that online attacks on Jews have continued unabated during this year's mid-term elections; what was once relatively rare online harassment is today commonplace. Part of the recent rise in anti-Semitism is grounded in hostility to the political rise of Barack Obama, the nation's first African-American president, says Emory University's Deborah Lipstadt. "I never say that President Trump and those around him created this, they didn't. But they lit a fire under it" the religion professor told NPR on tonight's All Things Considered. "Now we're seeing that the online harassment can move further over to real danger," she says. Others say a viciously partisan political culture today, where personal attacks on character, motive and even background often supplant substantive policy debate, has given a tacit wink to extremist elements. "I think it's important to remember that, while violent far-right ideology appears to live on the fringes, it is very informed by the mainstream acts of intolerance," says Tony McAleer, a former organizer for the White Aryan Resistance (WAR). McAleer co-founded of the group Life After Hate that works to reform racists. President Trump has called for unity and forcefully denounced both the synagogue murders and the recent mailing of explosive devices to prominent Democrats. A lot of the stuff was there before but now there's a boldness in it, people feel that they don't need to self-censor. It's like the mask has been pulled off. But the ADL and others have pointed out that public anti-Semitism and intolerance have gone up markedly in the wake of Trump's election win. At last year's infamous Unite the Right rally that turned violent in Charlottesville, Va., neo-Nazis paraded with torches chanting "Jews will not replace us." Afterwards the president famously took criticism for saying there was "blame on both sides" and "good people" on both sides. "The president has been stoking the fires that have contributed to these violent white nationalist attacks, with his divisive statements and with his immigration policies," says Cecillia Wang, deputy legal director of the ACLU's Center for Democracy. "He has a responsibility to undo the damage now, and so do other officials in his administration." Republicans, including the president, have recently accused Democratic party donor and philanthropist George Soros, who is Jewish, of backing, among other events, the caravan of Central American migrants heading toward the U.S. border. There is no evidence behind these claims. Soros was one of the Trump critics targeted by mail bombs last week by an avid Trump supporter. Today Soros continues to be a target of a dizzying array of conspiracy theories as well as ongoing GOP midterm attack ads. Earlier this month Trump also alleged that the 88-year-old billionaire is paying people to attend his rallies. Several conservative groups, including the Republican House campaign committee, are running ads on Facebook that feature Soros as a nefarious master financing an array of Democratic efforts, according to data from the social media company and reported by the Washington Post. "The slurs against George Soros that Republicans continue to invoke are dredged up from centuries of nauseating anti-Semitism," is how Rep. Bill Pascrell Jr., a New Jersey Democrat, put it in a recent statement. "They must stop trying to divide America and help us lower the national temperature. For years now, Donald Trump has been calling for the jailing of his critics and has lauded violence against journalists. The revolting 'Lock Her Up' chants have stoked the flames of hate." "A lot of the stuff was there before but now there's a boldness in it, people feel that they don't need to self-censor," says Tony McAleer. "It's like the mask has been pulled off," he says, adding, "People are expressing themselves in ways that they never did before and the general political climate is getting more aggressive, more physical." McAleer says when he worked as a recruiter for hate groups, he ran a computer operated voice mail system that he notes, "was primarily anti-Semitic. I was also a Holocaust denier," he says, "I was very well-steeped in the ideology of the suspected shooter [in Pittsburgh]." It was the birth of his children and empathy from a Jew that helped pull McAleer out of his bubble of hate and anger. "A Jewish man helped me de-radicalize. It was the compassion from him that helped me get rid of the ideology," he says. Selim, who formerly headed up the Department of Homeland Security's efforts to counter violent extremism, left government just over a year ago, citing hyper-partisanship and divisions that he laments have only gotten deeper and more vitriolic since then. "It's time for responsible leaders and individuals of all faiths, races and ideologies to speak out clearly and forcefully against the anti-Semitism that we've seen in the last week and the scapegoating and bigotry that's really been on the rise in this country in the last several years," Selim says.